School Library Journal reviewed Freak City it its January 2014 issue. Freak City is the story of a teenage couple's relationship as they learn to communicate using sign language. "Readers are left knowing that the strains of understanding between two cultures are complicated but not insurmountable." This title is part of a new imprint, Scarlet Voyage. You can order it from enslow.com, your preferred vendor, local bookstores, Amazon, and Barnes and Noble. It is available in hardcover and e-Book formats. Today we celebrate Helen Keller's birthday and how she overcame the obstacles in her life. Helen Keller was born both deaf and blind. She traveled to many countries working for world peace and for the rights of deaf and blind people. Helen Keller never learned American Sign Language. Instead, she used fingerspelling by touch taught to her by her teacher, Anne Sullivan. To speak with her, a person fingerspelled into her hand. She could "read" fingerspelling with amazing speed. Young readers can learn how people today are overcoming barriers with this new series from Enslow! Many years ago, I took a sign language class at an adult school after work. Have I used it? Unfortunately not. My main reason for taking it was because I was a volunteer EMT (at that time,) and thought that having a basic knowledge of sign language might help on calls. When I look at Enslow's new title, What Is Sign Language?, I appreciate the fact that the alphabet is in the book, reminding me of how to create the letters. This 48 page title is geared toward upper elementary readers, giving them some personal stories into the lives of children who are dealing with deafness every day. Another new title, What Is It Like to Be Deaf?, also gives an overview about sign language, but also discusses hearing aids, videophones, and the latest technology that help those who are deaf interact with people. This book includes personal life stories of young children who are deaf. Both of these titles are available directly from Enslow or your preferred vendor. The American Speech-Language-Hearing Association (ASHA) has declared May to be Better Hearing and Speech Month. This site explains the specifics of how we hear, as well as screening and testing, implants and hearing aids, and more. Speech and language development, as well as disorders affecting them are also discussed. This website also has a section dedicated to students considering a career in these fields. 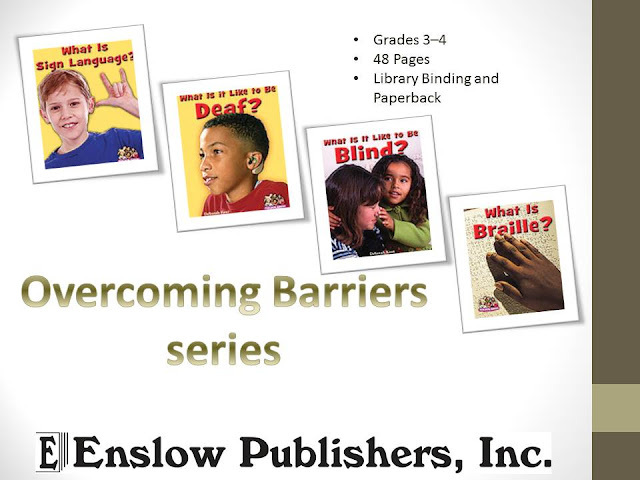 Overcoming Barriers is Enslow's series geared toward different methods of communication for the elementary student. Two of the titles in this series are helpful for the hard of hearing student. Written for grades 3-4, these 48 page books discuss being deaf and sign language. In What Is Sign Language?, learn how a fourth-grade student uses sign language to communicate. Titles in the Overcoming Barriers series are available in library editions. The paperback editions will be available this fall. One of Enslow's new titles for spring, What Is Braille? gives readers in grades three through four a greater understanding into the lives of people dealing with challenges. This title is part of the Overcoming Barriers series which includes: What Is It Like to Be Blind?, What Is It Like to Be Deaf?, What Is Sign Language? as well as What Is Braille? All four titles in the series are authored by Deborah Kent and feature color and black-and-white photographs and illustrations as well as words to know regarding the title's topic. What Is Braille? contains great chapters such as "Creating the Code", "Braille at Work", and "What Is the Future of Braille?". This title allows young readers to learn more about this valuable means of communication for the blind as it demonstrates how people use Braille to live active and meaningful lives.